Looking for something to do this week? Look here. 2. Kids Aloud 2019, Royal Hall, Harrogate, March 29 and 30. Children from Nepal are set to join voices with 14 local schools in the Kids Aloud 2019 concert. Over 500 youngsters will perform traditional songs and instrumental music from Nepal in the first half and the second is devoted to a musical version of a Nepali fairy story, Monkey Boy, for which children from most of the participating schools, including those in Nepal, have written six of the songs. Tickets are available priced £12 (children £8) from the Harrogate Theatre box office: 01423 502116. 3. Lightwater Valley Theme Park, Ripon, Saturday April 6-Sunday April 28. Visitors will be able to try out the brand new Outer Space themed Magic Lights Puppet Show in the Show Barn, with two shows a day throughout the Easter holidays. And people can meet Jester and Jasmine, the park’s lovable dino mascots as they meet and greet families from 3pm and join in as they entertain the crowds with their choreographed dance shows including their favourite hit song, Baby Shark. There will be a treasure trail egg hunt on Friday April 19-Monday April 22. 4. Mother’s Day, RHS Harlow Carr, Harrogate, Sunday March 31. Gardeners at Harlow Carr think there is nowhere better to treat mums on Mother’s Day. They say a leisurely stroll around the garden, taking in the spring bulb displays and perhaps a tearoom treat is just the perfect way to celebrate the day. 5. Film Night, Bohemian Rhapsody, Darley Cinema Winter Season, Darley Memorial Hall Saturday March 30, doors open 6.45pm. Rami Malek stars as Freddie Mercury in this biopic. Before the main film there will be a local interest film. The film is Cert 12A. Pay at the door, price £5 (£2 for juniors). 6. Spring Garden Opening for NGS charities, Goldsborough Hall, Church Street, Goldsborough, Sunday April 7, 12-4pm. Highlights include Spring bulbs in the woodland walk and over 50,000 daffodils in the Lime Tree Walk. Light lunches, cream teas, cakes and plant stall. Adults £5; kids free. Dogs on leads welcome. 7. Wizard of Oz, North Stainley Arts Society at North Stainley Village Hall, Friday April 5, 7.30pm and Saturday April 6, 2-7pm. The homage to the Film 80 years on from its release is a musical production that will take the audience on an epic journey from Kansas to the magical Emerald City, with all the well known characters. Ziggy, aka Toto the dog, will take a starring role. Tickets £8 ring 01765 635236. 8. 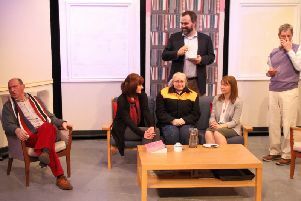 Knaresborough Players present Four Nights in Knaresborough, until Saturday March 30, 7.30pm. This new production dramatises the most notorious year in the town’s history. On Christmas Day 1170, four knights – Reginald FitzUrse, William de Traci, Richard le Bret and Hugh de Morville – left Henry II’s court in Normandy and four days later murdered Archbishop Thomas Becket in Canterbury Cathedral. They then fled north and holed up for a year in Knaresborough Castle. Tickets £10 (£8 over 6o) from The Old Chemist Shop, Market Place, Knaresborough or phone 07835 927965. 9. Easter EGGstravaganza, Boston Spa Village Hall, Friday March 29, 7pm. Demonstrations by Andrew Thwaite, former head of the York Chocolate Museum and Lynda Jameson, former head of cake decorating at Betty’s in Harrogate. Pay on the door. 10. Ceilidh, St Wildrids Hall, Harrogate, Friday March 29, 7.30pm. The Phoenix Ceilidh Band, along with Tcoporium, to guide people through the moves to help raise money for the children of Malawi.